Dredging and filling destroys seagrass habitat directly by digging and indirectly affects nearby habitats by suspending sediments. Dredging and filling activities cause major damage to Florida’s seagrass habitats. 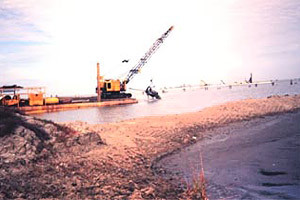 Dredging is used to create deeper waters for channels and canals as well as collecting sediments for landfill in construction projects. These activities destroy seagrass habitat and impact other surrounding habitats. As a direct result of dredging, sediments are suspended in the water increasing turbidity. Increased turbidity causes a decrease of light penetration into the water, thereby reducing seagrass growth and survival. Boat propellers have scarred over 30,000 acres of seagrass. In south Florida, over 30,000 acres (121 square km) of seagrass have been scarred by boat propellers. Scarring is caused primarily by large numbers of small boats, although larger boats cause a much greater impact when they run aground. Damage occurs when boats enter shallow waters, causing the propeller to come into contact with seagrasses. This creates damage as the propeller slashes into the bottom substrate. Recovery and growth of seagrasses in these scarred areas takes years, and if the damage is repeated, the seagrass bed may never completely recover. Scarring also leaves seagrass beds vulnerable to storms and other forms of erosion. This may result in the resuspension of sediments into the water column, further inhibiting seagrass growth. Aerial surveys found more than 173,000 acres (0.7 square km) of scarred seagrass beds off the coast of Florida. The most extensive damage is seen in the Florida Keys, Tampa Bay, Charlotte Harbor, and the north Indian River Lagoon. 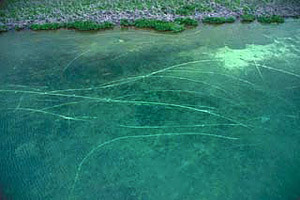 Between 10% and 20% of the seagrasses have been lost in the Florida Keys due to repeated scarring and boat groundings. Increased amounts of nutrients causes phytoplankton blooms, reducing the amount of light reaching the seagrass. 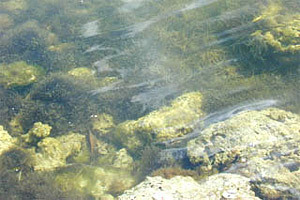 Seagrasses are sensitive to increase amounts of nutrients from sewage outfall and industrial wastes. A moderate amount of nutrient input may increase seagrass growth, however dramatic increases in available nutrients typically prove harmful. High nutrient input causes excessive epiphyte growth as well as phytoplankton blooms, reducing the amount of light reaching the seagrass blades. dredging: to dig, gather, or pull out of a body of water.